BROWARD COUNTY, FL -- Internationally renowned artist Dale Chihuly has created a beautiful wall sconce installation forBroward County&apos;s Port Everglades as part of the Florida port&apos;s continuous investments in creating the ultimate cruise guest experience. "When you are ranked among the world&apos;s best, of the highest caliber, a world-class facility, you attract first-rank cruise lines, their upscale customers and internationally acclaimed artists," said Steven Cernak, Port Everglades Chief Executive and Port Director. "Chihuly is renowned for his ambitious architectural installations around the world in historic cities, museums and gardens. And now Port Everglades is the only seaport in the world to have a Chihuly!" Artwork, such as Chihuly&apos;s "Coral Glow Persian Sconce Wall" installed in the recently renovated Cruise Terminal 4, is part of the overall cruise vacation experience, Cernak says. Port Everglades works in conjunction with Broward County&apos;s Cultural Division to select Florida-inspired artwork such as Michele Oka Doner&apos;s blue-green terrazzo floor seascape embedded with hand-carved bronze sea pods in Cruise Terminal 18, and Mark Fuller&apos;s colorful prism-like fish mobiles in Cruise Terminal 19. "A working cruise terminal presents challenges to most artists, especially for large-scale installations. With his background in architecture, Dale Chihuly immediately understood our constraints of space and lighting. Working within the defined parameters of the terminal debark lobby, Chihuly designed five sculptural works and strategically clustered them in a 14&apos; x 12&apos; area. The resulting illusion is a magical &apos;wow&apos; experience for our departing cruise visitors," said Port Everglades Assistant Port Director, Peg Buchan. Cruise guests will experience Chihuly&apos;s dramatic flower-like forms that bloom larger and brighter on the lobby wall as they descend from the second-floor debark area to the first-floor baggage hall. The spiral and herringbone surfaces are lively and energetic. Exterior lighting will cast colorful shadows on the wall behind the artwork. Cruise executives will have the opportunity to tour Port Everglades and see Chihuly&apos;s "Coral Glow Persian Sconce Wall" during UBM&apos;s Seatrade Cruise Global in March 2016 at the Greater Fort Lauderdale/Broward County Convention Center. "We work closely with Port Everglades on a variety of art installations, each designed to enhance the cruise visitors experience," says Leslie Fordham, Broward Cultural Division Public Art & Design Administrator. 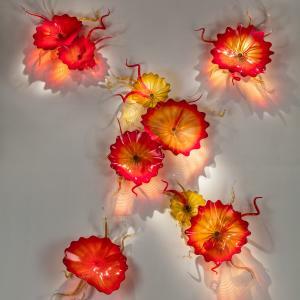 "Chihuly&apos;s artwork is dramatic and visually compelling. It will leave a lasting impression of Broward County as an upscale, dynamic and art-savvy community." Chihuly is credited with revolutionizing the Studio Glass movement and elevating the perception of the glass medium from the realm of craft to fine art. He is renowned for his ambitious architectural installations around the world, in historic cities, museums and gardens. Chihuly&apos;s work is included in more than 200 museum collections worldwide including the Metropolitan Museum of Art, the Smithsonian American Art Museum and the Corning Museum of Glass. Major exhibitions include Chihuly Over Venice (1995-96), Chihuly in the Light of Jerusalem (1999), Garden Cycle (2001-present), de Young Museum in San Francisco (2008), the Museum of Fine Arts, Boston (2011), Virginia Museum of Fine Arts, Richmond (2012) and the Montreal Museum of Fine Arts, Montreal, Canada (2013.) Chihuly Garden and Glass opened at Seattle Center in 2012. Located in the second largest county in Florida, Broward County&apos;s Port Everglades is consistently ranked as one of the three busiest cruise ports in the world with more than 4 million passengers in 2014. Nine cruise lines, one ferry and more than 40 cruise ships sail from the South Florida seaport including: Balearia&apos;s Bahamas Express (ferry), Carnival Cruise Line, Celebrity Cruises, Costa Cruises, Cunard Line, Holland America Line, Princess Cruises, Royal Caribbean International, Seabourn and Silversea Cruises. The Port&apos;s wide-ranging fleet of cruise ships provides guests with an array of cruise vacation choices from the sunny Greater Fort Lauderdale, Hollywood and Dania Beach area. View details on the latest cruise offerings at porteverglades.net or contact the Port atPortEverglades@broward.org.